Truly, I promise – I have home tours coming! Several people, *ahem, have said soon they will share their spaces. They will show us what makes their home their home! Meanwhile, the firstborn has submitted hers. Tara is a home-maker, as many women are. She makes home while mommying, wife-ing, travelling in ministry, song-writing, recording, etc. She is always excitedly telling us about one project or another and very thoughtfully creates spaces that reflect the love between her and Dave, for their son and the life of worship to God they are building. A guest in their home recently commented, “Your house is…warm.” It is! They use every inch of yard space to enjoy their family life. And loving the outdoors like they do, Tara utilized an old tree stump as wall art later adding sepia prints from a family photo shoot. It is striking. And simple! 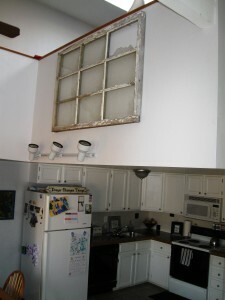 You can kind of see the loft and skylight above and the kitchen opening from the living room. The old window matches my coffee table as it is from Tara’s elementary school in Nebraska. 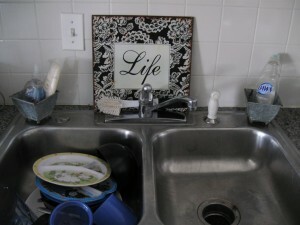 Tara specifically left the dishes in the sink under the word “Life” because that is what dishes are! 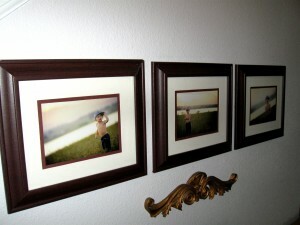 Photos of the little guy hang on a dining area wall. 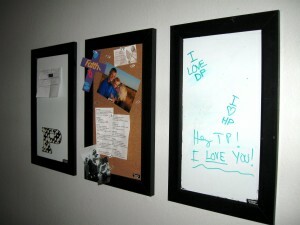 Tara loves to organize life via bulletin and message boards. Down the hallway, and a picture of our Home Tour hostess – taking pictures. 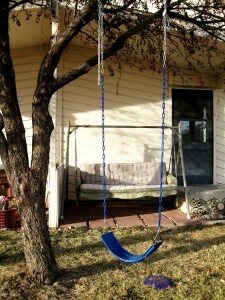 By the way, Tara told me she really had a blast photographing her home – just like I told her she would. 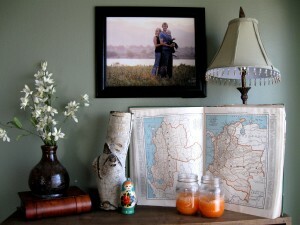 Old maps, atlases, anything about world travel can find itself in the Powers family decor. There are a lot of photographs of their little family, peach soy candles, and one-of-a-kind art by a friend atop the bookshelves. 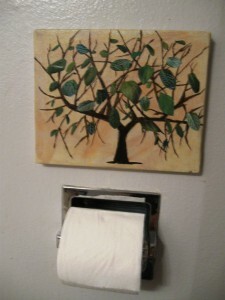 In the upstairs bath, French poster art (on canvas), and a piece from Tara’s sister, Stephanie, – the tree above the bath tissue. 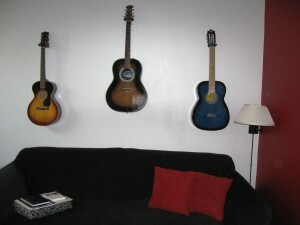 A gift: Hunter in pencil; Dave’s guitars as art in the loft/TV area. 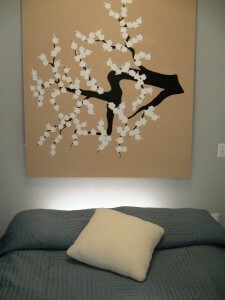 Giant art canvas painted by Pearl as a headboard. A photo I really love (I found it in my pictures) of Tara, Dave and Hunter Christmas 2007. They took it themselves and it really captures them at home. 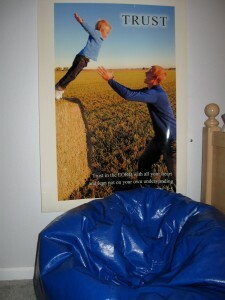 Hunter’s room-you gotta LOVE this poster of him with daddy and the accompanying scripture. 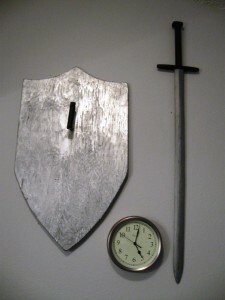 Some of his weaponry hanging. 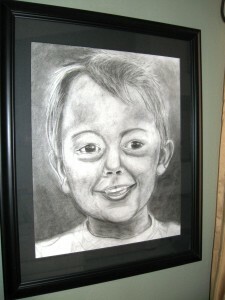 They are good about encouraging the wild-hearted boy in him. 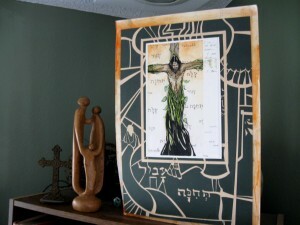 These are some of the parts of Tara’s home that makes it theirs. I can think of other scenes in her inviting house that I am surprised she didn’t send. I hope she’ll discover more of the home she is building through the camera lense. It is a wonderful new way to see. I love being able to see Tara’s home. I feel more connected to her now. I have not commented in a while, but I am enjoying reading and looking at the pictures you are posting. I love it! It makes me want to move in – So peaceful! Good job! 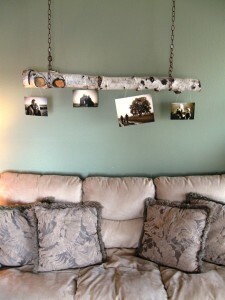 I forgot to mention that I may have to steal Tara’s tree/log with pictures idea. Way cute! The Powers’ home has always really spoke of “home”. You know what that word means when you go there. It’s not just something you flippantly say referring to the place you sleep. I just love love love that color in her living room! I also love the hanging log, and the window. That wasn’t up when I was last there. I just might have to steal some of your ideas. Beautifully done Tara! You think there is a lot that I missed?! I thought I really got a lot of it. 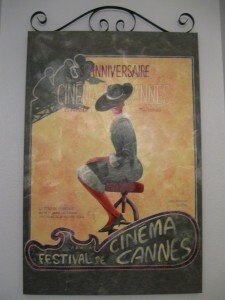 There were some pictures that I didn’t send to you. 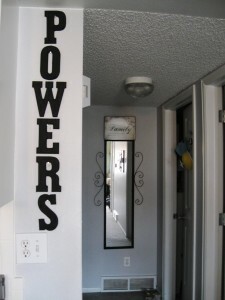 It’s kinda funny because now doing the pictures I’m ready to redo my downstairs bathroom. I’m seeing Birds. The really colorful looking retroish cool ones;) We’ll see. I did LOVE taking pictures of my home for you though. Very fun! Oh I love the coziness of Tara and Dave’s home. 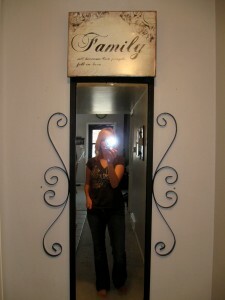 I love the log wall hanging in the living room and just love Hunter’s room! So inviting. Thanks for sharing Tara! !